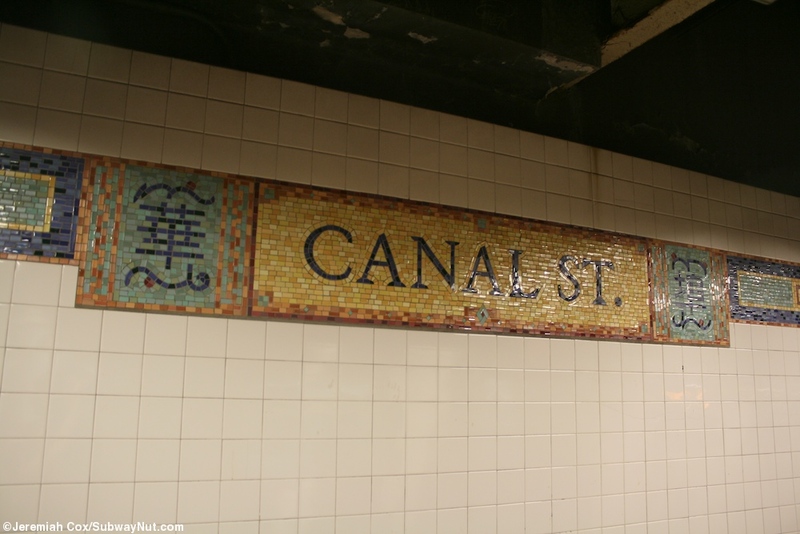 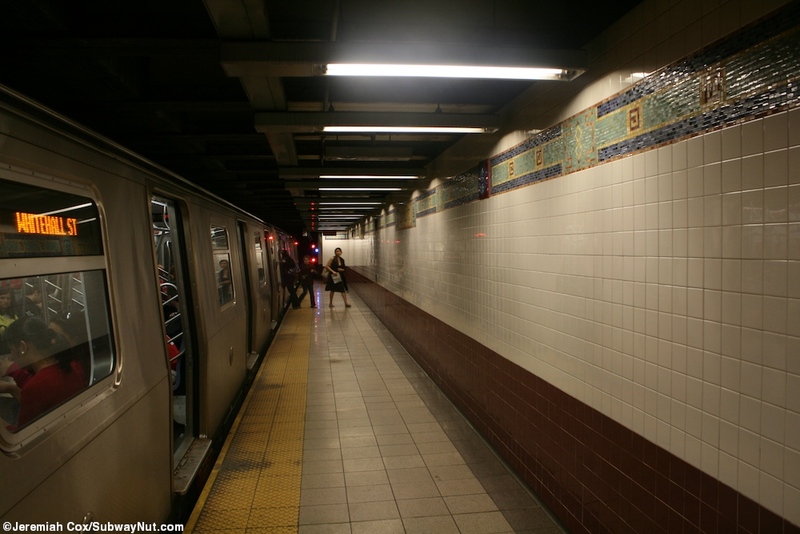 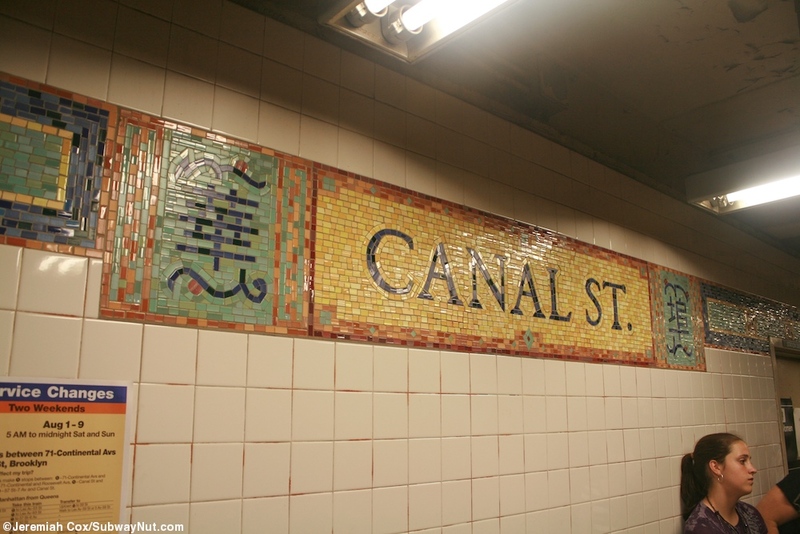 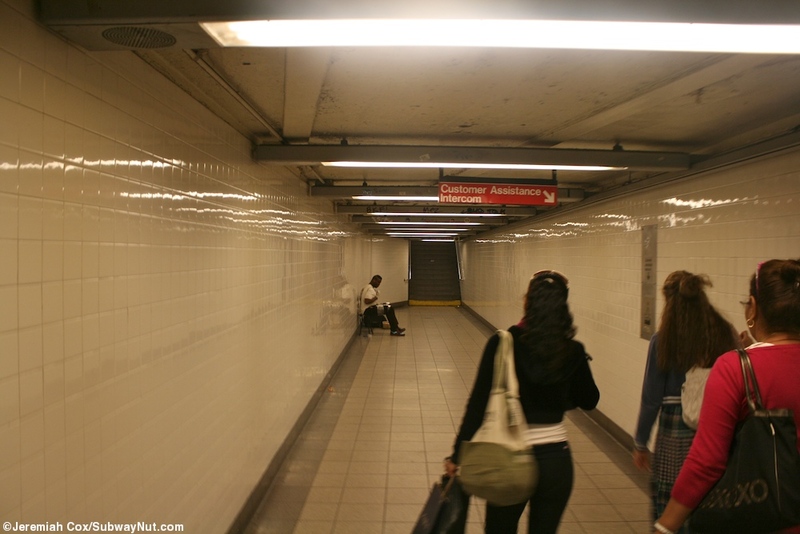 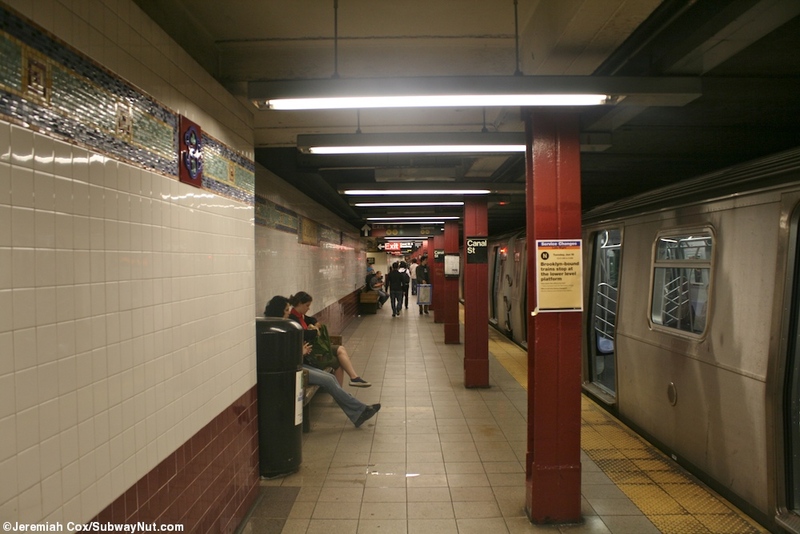 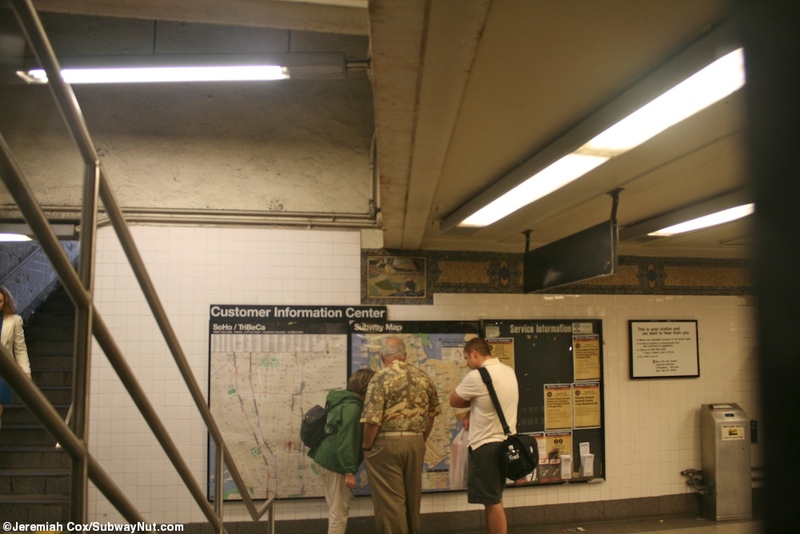 The Canal Street Broadway Line Upper Level via Tunnel Station is the one that is farthest west and least connected to any of the other portions of the station. 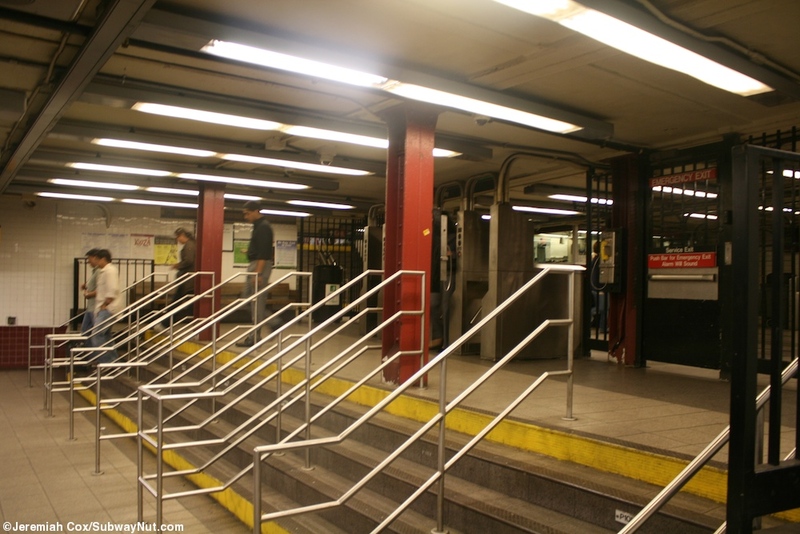 The stop has two side platforms for the line that's between two and four tracks within the station with two now completely useless sidings forming the middle tracks, these can only fit eight car trains and only ten car trains are run today on all Broadway Line trains. 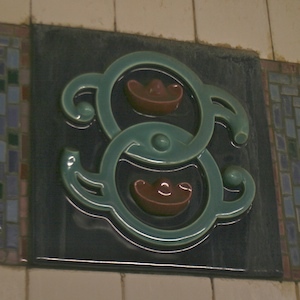 They are part of the City Hall lower level complex station, a never realized extension that was built to connect up to the Brooklyn Bridge. 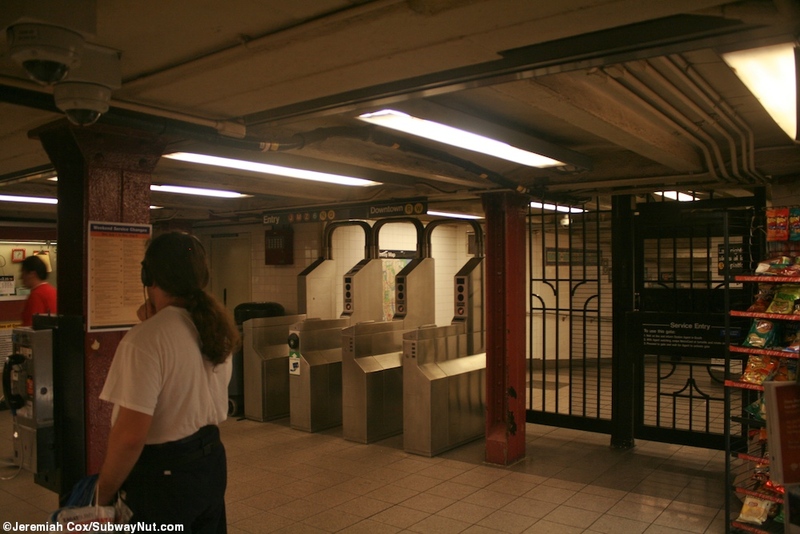 The station has simple exits all in the middle of the station. 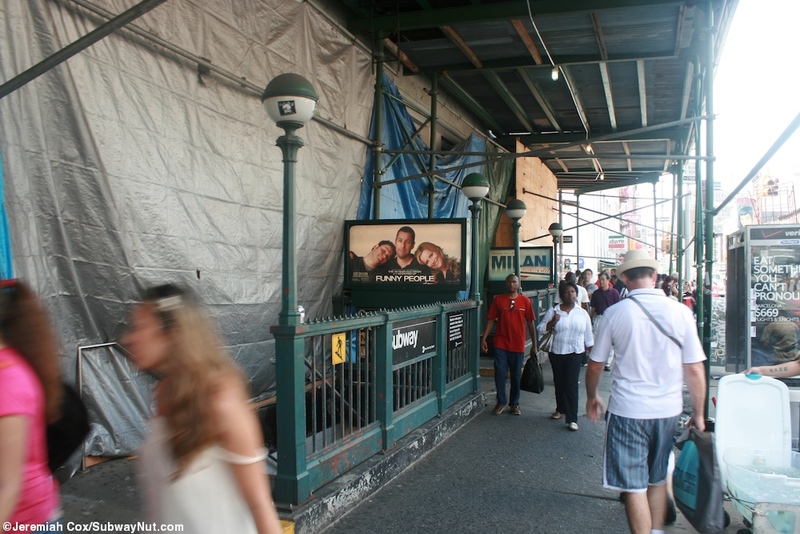 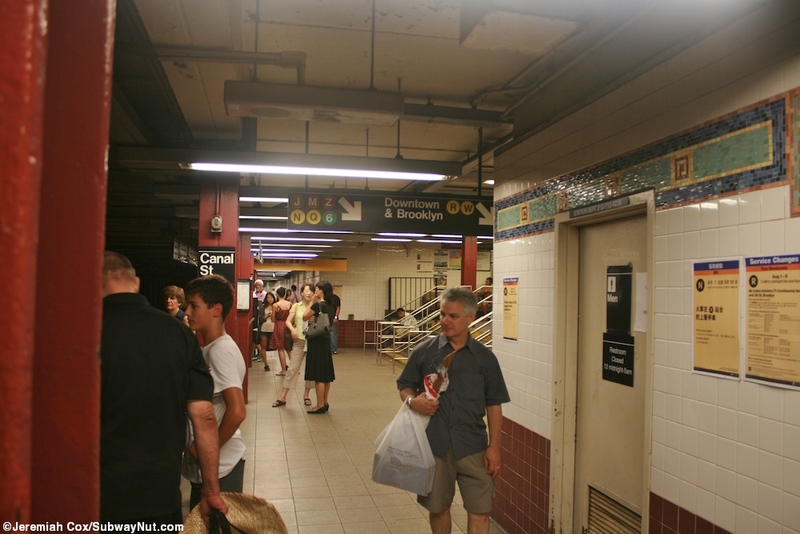 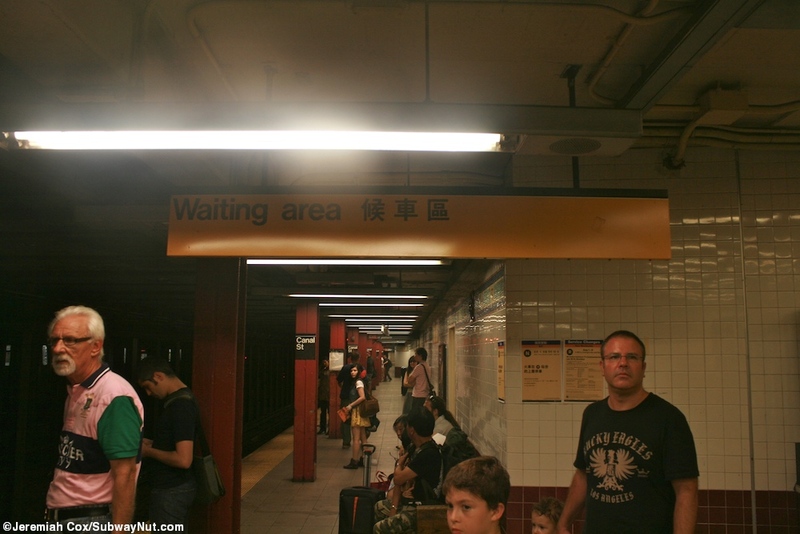 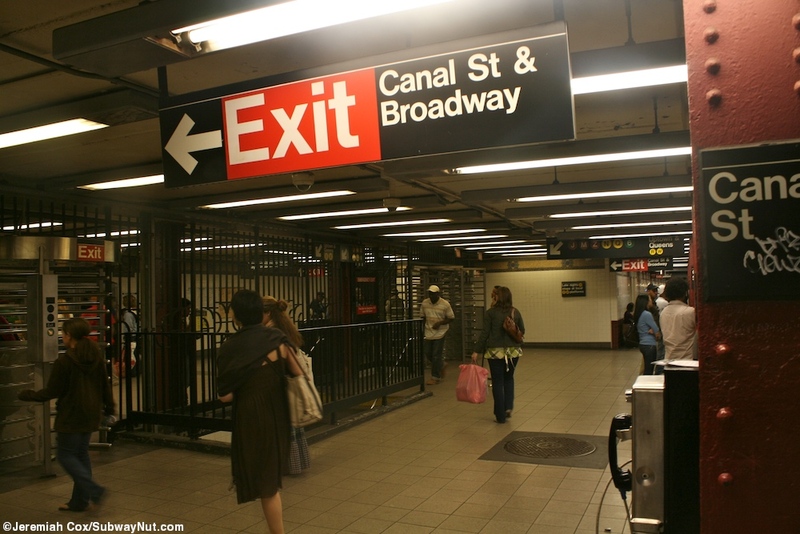 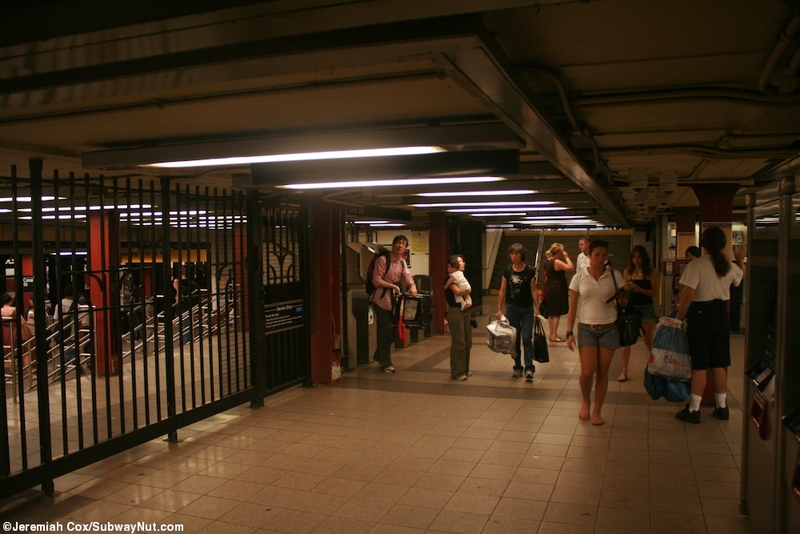 In the middle of the downtown platform is the platforms only exit with only High Turnstiles leading out to four street stairs, two on either side of Canal Street on the west side of Broadway. 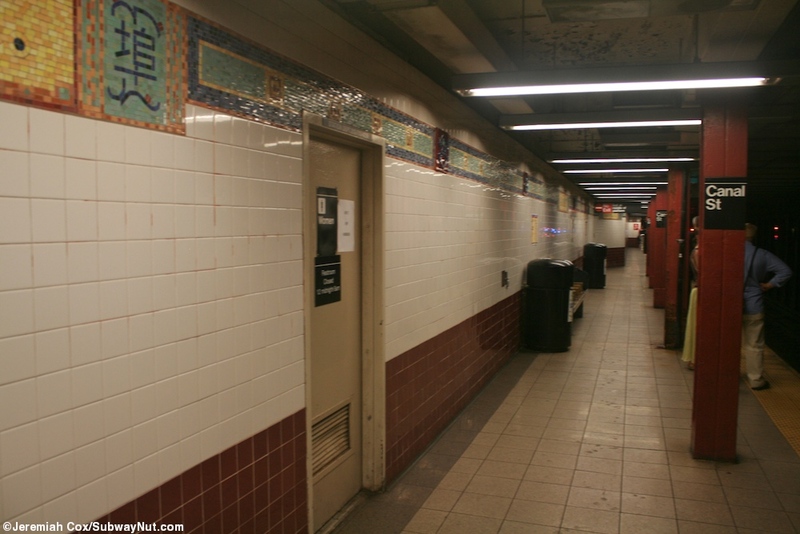 In font of this entrance is a simple narrow staircase that leads down to an underpass area beneath the Broadway Line tracks, as the underpass passes beneath the uptown platform which has a small staircase down to it right next to its entrance before coming up another staircase and reaching the main corridor to the N,Q station platform. 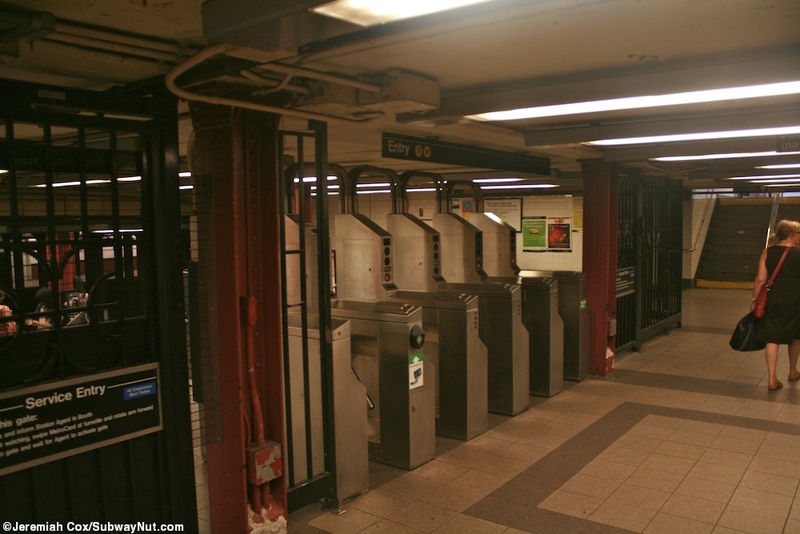 The exit on the uptown platform is the main entrance and 24 hour token booth, a wide staircase leads up to it from the uptown R platform and there is a second large bank of turnstiles that lead to the main corridor to the N, W platforms (that is joined by the R's connecting underpass) that is short and soon splits and provides single wide staircases down to the western (railroad north) ends of both N,Q Bridge line platforms. 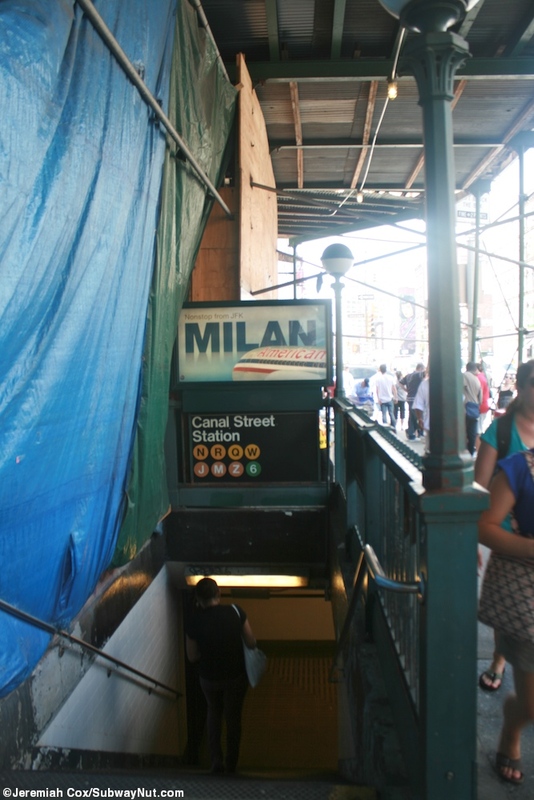 The main entrance has two sets of street stairs on the SE corner of Canal Street and Broadway, along with an entrance staircase set back in a building on the NE corner.